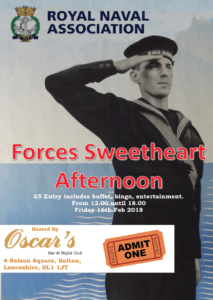 RNA Bolton Branch will be hosting a Forces Sweetheart event on Friday the 16th February 2018 from 12.00 noon until 18.00 hrs. The event will be held at Oscars Bar at Nelson Square, Bolton. The entrance will be £5 per person but this will include a full afternoon of entertainment, food, raffle and bingo ticket. There are a number of artists planned for the afternoon. RNA Members please come in No 1’s or others in 40’s /50’s attire. Pay on the door, but come early!